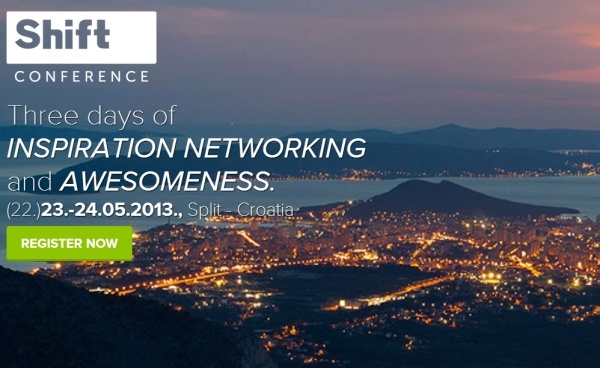 SHIFT Conference will be held in Split, Croatia for the second consecutive year and is expected to draw 500 participants, with 32 startup teams competing in the challenge to win $10,000. The deadline for the application submission is 22 of April 2013. I spoke with Ivan Burazin, one of the co-organizers, and he told me that the event last year was organized the Startup Live brand, but that there was a small difference of opinion among the organizers over the direction of the event and, as a result, this separate event will be held this year. Early-bird tickets for students are 60 euro and 121 for all other participants. These tickets can be purchased at these prices until March 30th or at the ordinary price of 112 euro for students and 244 euro for “ulaznica” until the date of the event. The event will be held on May 23rd and 24th, but details regarding the exact location, schedule, and mentors and partners participating have yet to be finalized. Burazin also offered a photo gallery for those interested in seeing how the event went last year.